A note… I apologize for the length of this post (I read somewhere that blog posts are supposed to be short) but I believe our relationship with the Carbone Cancer Center is important to share and I wasn’t sure what part to leave out. Here’s our story that starts with a question. Does “We Believe in Katie” (aka “The Little Nonprofit That Could”) Really Matter – Especially as it Relates to Cancer Research? Over time, it was becoming more and more important to actually see the benefit of our fundraising results and share specific outcomes with our supporters. Granting wishes for sick children made sense. We could actually see where our money was going, experience the joy of our efforts and share those tangible pictures and stories with all of you. However, our desire to contribute to cancer research was a lot bigger, felt a lot less personal, and the results were certainly more “intangible”. I remember an academic researcher I know commented that unless we have really large sums of money to donate our efforts really wouldn’t have much impact. I was told by other “fundraisers” that to really make a difference we would need a large platform (like celebrities have) or millions of dollars and we don’t have either of those. I often felt that maybe what the researcher said was true and our relatively small contribution wouldn’t matter much in the larger scheme of cancer research. But, at the same time, there was this tiny voice inside that was urging me to consider another way of thinking about this. Maybe what I was hearing (and feeling) wasn’t accurate. Perhaps in our small way, our efforts did matter. But I needed more. Could I find something tangible at a large and daunting organization like the Carbone Cancer Center? Could contributing to something so big help make sense of Katie’s life and her death? Over the course of the past 15 months this is what I’ve experienced on behalf of all who support, “We Believe in Katie” and it feels pretty amazing. From the beginning the Doctors, researchers and fundraising personnel at Carbone talked to us – at length. They gave us tours of their labs, invited us to Carbone events and, in turn, attended our events. It was obvious from the very start they care. Over the past several months Dr. Mark Juckett, Dr. Aric Hall and Dr. Howard Bailey have met with us and described where our money would be applied. Last year’s funds went toward a preliminary bone marrow transplant research/protocol that was in its infancy stage. Now, it has progressed and is nearly ready for implantation. What is so very exciting, personal and tangible is how it connects to Katie and Rayce. This gets a bit technical so please bear with me as I attempt to explain this protocol in understandable terms as they were so patiently explained to me. First, a bone marrow transplant (BMT) is a procedure to replace damaged or destroyed bone marrow with healthy bone marrow stem cells to attack the cancer /blood disease. However there are side effects, with the most common being Host versus Graft Disease where the immune cells from the donor attack the patient’s healthy tissue. As the doctors explained there is always a very delicate balance between suppressing the patients immune system (via immune system suppressant drugs) so as not to attack the new bone marrow while at the same time not suppressing too much to keep the new bone marrow from attacking the cancer or fighting an infection. Both Katie and Rayce had received BMT but, sadly, neither were successful. This new BMT technique, which was developed in Germany, is where the antibodies that could cause rejection (attacking the new bone marrow) are removed from the bone marrow before it is infused in the patient. The goal is to introduce a “ready to work” immune system via this new, engineered bone marrow. It eliminates rejection, and in essence doesn’t “wait” for the new immune system to take hold. The positive effects of the new bone marrow is much more immediate – especially important because time is of the essence. The Doctors from Germany have been collaborating with Carbone Doctors for the past year to create a lab at UW to replicate this technique. It has the potential to treat high-risk leukemia patients – especially young adults (like Katie) and children. The second “branch” of this study/protocol uses this same technique to treat non-cancer diseases like Aplastic Anemia, which is what plagued Rayce. Dr. Inga Hoffman, Rayce’s Doctor will be implementing this branch of the protocol. Although I have not met her yet I will soon. When I met Rayce’s mother, Jess, last November and invited her (and her family) to become part of our benefit I had no idea how this research study connected Katie and Rayce – yet again another uncanny connection. The funds our two families together with all of you, will raise at this year’s benefit will be directly applied to this cutting edge protocol/research. Our dollars may pay a salary of a statistician or data collection staff member, help purchase a piece of equipment or perhaps cover other lab costs. Our funds will also be combined or matched with other funding sources to support this protocol right here at the Carbone Cancer Center in our community. That feels pretty powerful, and personal to our story. I know and feel in my soul our “little nonprofit that could” is making a difference and our efforts do matter. John and I KNOW that there is a “Katie” or a “Rayce” who will have a much better chance of surviving and thriving because of the efforts at Carbone, specifically this protocol/study. All of us have a tangible part in giving hope and making a significant difference. The money is important, for sure, but that’s only part. It’s about the people we’ve met, the stories we’ve heard, and the heartfelt compassion these really smart people feel towards the Katie’s and Rayce’s they encounter each and every day. It’s about the chills we get when another uncanny coincidence occurs, it’s the sincere gratitude we’ve received from the Carbone Doctors who truly value what we can contribute and it’s knowing that with your generous help we are doing something meaningful in the face of such tragic loss. None of this would be possible without your help. So, are we making a difference? Do we matter? A resounding Yes! It’s all about how you look at it. From the bottom of our hearts we thank you for being our friends, and believing in what we’re trying to do. Know that you are part of something much bigger than “our little nonprofit that could.” You are making all the difference…in so many, many ways. One more thing…please join us on April 27th! 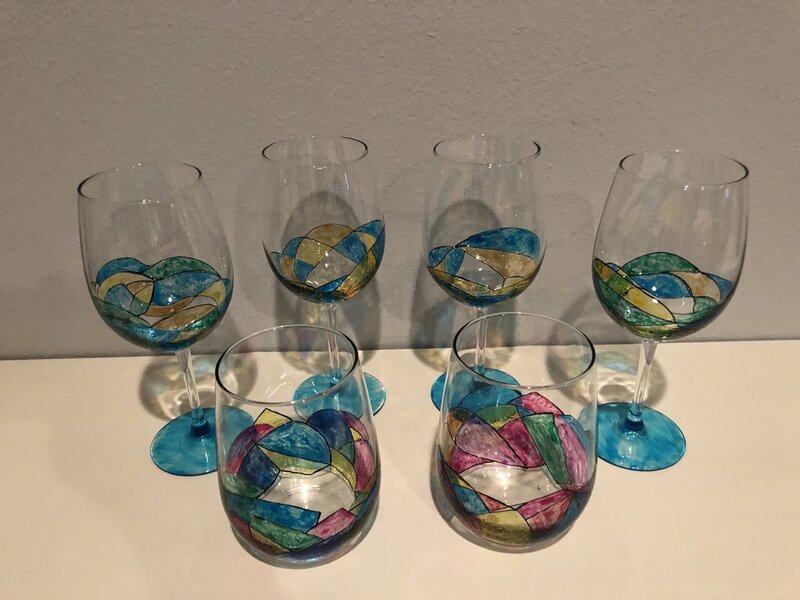 A few months ago I, along with mom and my sister Claudia, took a wine glass painting class at Prairie Ridge of Galena, where my mom is now living. Claudia and mom weren’t really excited about the class but humored me and went along. I really enjoyed it and found it be sort of therapeutic. Long story short I’ve been painting wine glasses, making matching napkins and wine bottle covers and selling them with all of the proceeds going to “We Believe in Katie.” And, although Claudia didn’t enjoy the painting part, she is REALLY good at choosing fabrics, designing displays, and packaging! So in many ways it’s been a team effort. I’ve had a couple of shows and this Saturday, February 9th, I will be selling the results of my new hobby at the Purple Goose Boutique in Verona from 10:00 – 4:00. The second Saturday of the month Haley Jones, the owner of the Purple Goose , opens up the second floor of her boutique for people like me who sell their art work/crafts. Stop by if you can and keep in mind if you don’t find the arts/crafts of interest she sells really neat clothes! I’m also thinking about offering wineglass-painting classes. I thought it might be fun for a group to get together have a little wine, paint a wineglass, laugh, have fun and donate to a worthy cause! I’ll keep you posted about that part of this new hobby. Maybe I’ll see you Saturday! A number of Katie’s friends have suggested writing about my experiences and including them on our “We Believe” website. I agreed that maybe it would be a good thing but for whatever reason the time just didn’t feel right. I think it does now. Perhaps sharing what it means to survive tremendous loss might help someone else. Offering updates about our lives, Gracie’s life (Katie’s daughter) and “We Believe” might be interesting. And, I would like the opportunity to share the many stories of kindness, generosity, and “spiritual events” that I can’t explain I don’t want to sound “Twilight Zoney” but so so many things have happened and continue to happen that have no earthly explanation…I KNOW it’s Katie’s loving presence at work. Loss like this is a strange thing. When Katie first died (still hard for me to write the word) I didn’t think I could “go on”. I didn’t want to. Would the pain ever stop, would I ever feel whole again, how could I possibly live without my beautiful daughter, closest girlfriend, and a child I loved so deeply? While life does indeed “go on” there are some things I’ve learned about what that really means. First, I couldn’t do it alone. I (sometimes just me and sometimes with John) met with a grief counselor - often. I cried – hard – a lot. I read, took long walks and tried to be grateful for what I have. I reached out to people, and people reached out to me. I made new friends, lost friends and found others who have lost children and knew my pain. There were people who could so easily ask about Katie (and yes, say her name) and others who couldn’t – maybe it was protecting me or just too painful for them to think about. And to be totally honest, I probably would have been the latter kind of friend – until now. Time has brought me to a place where I can say Katie’s name without crying (I think Joe Biden said the same thing about losing his son Beau) and even remember the things she did that made me laugh and smile. It’s easier to look at her pictures and remember. I spend time with Gracie and see Katie and laugh – she is so much like her mom. The pain does subside. The “kick in the gut - I can’t get my breath” grief moments come much more infrequently and have changed to a dull ache that never goes away and never will. I KNOW her beautiful spirit and presence is with me… that will never leave. Her spirit is very powerful and good. On the 16th of January it will be 2 ½ years since Katie left this earth. In some ways it was yesterday and in some ways was so long ago. My life will be forever defined as the time before July 16th, 2016 and my life after that day. Now, it’s a matter of building a different life than the one I thought I would have. I strive everyday (some days easier than others) to be grateful for Brian, his family, Gracie, my friends, Katie’s friends (that have now become my adopted “daughters”), family members (especially Claudia) and the professionals who have been so loving and supportive. I truly am grateful. As you know, a big part of our “new life” is our nonprofit “We Believe in Katie”. To date, we have raised nearly $80,000.00 for scholarships, blood cancer research and Make-A-Wish Wisconsin. Benefiting others has helped us in so many ways. How long will we continue? Right now as long as we can and are able. As for now we’re planning our spring benefit, which leads me to our event update. The upcoming Spring Benefit will be changing – in a really good way – with a new name and a broadening of our efforts. The new name is “We Believe Spring Benefit: Honoring Katie and Rayce” . Rayce Raschka was a young man from Sauk City who last June died of Aplastic Anemia, a curable blood disorder and although not cancer, very similar to the type of leukemia Katie had. He was an otherwise healthy high school senior looking forward to his last semester of high school and entering the University of Wisconsin Eau Claire in the fall. It started last January when Rayce suddenly got a nosebleed that wouldn’t stop and from the emergency room, was admitted to American Family Children’s Hospital. After three bone marrow transplants and numerous treatment plans he tragically died last June. It’s a horribly sad story that wasn’t supposed to end this way – I understand. I found out about Rayce through a number of uncanny connections and coincidences (as my grief counselor reminds me so often – there are no coincidences). We first heard Rayce’s story from our friend Rebecca at Make-A-Wish and learned how similar his loss was to Katie’s. The two of them had a number of things in common - Rayce was into musical theater (like Katie). Rayce’s teacher and friend, Matt Brennan performed at three of our We Believe fundraisers and is a good friend of Meg Aspinwall (Katie’s good friend). Rayce’s close family friends are related to a family we happen to be close to as well, the Sweeney family (Kaylan’s family). Rayce is described as having an “old soul” as Katie was so often described and has a birthday 6 days after Katie’s. He was kind and loving…like Katie. Both Rayce and Katie were supposed to survive. Through Meg I was able to reach out to Rayce’s mom, Jess where we shared a two hour coffee at Starbucks…we were the two mom’s crying in the corner. Long story short – we decided to include Rayce in our Spring Event. Rayce’s family and friends have a wide circle of support and want to do something in the spirit of Rayce, an exceptional young man. It seemed to make perfect sense to combine our efforts. After meeting, talking and crying with Jess, I feel that Katie and Rayce’s strong loving spirits were involved with helping their moms. Who knows? We will be sending out more details as they evolve. For the time being please mark your calendars for Saturday, April 27th. And, if you would like to help we are always looking for volunteers….we would love the help. There you have it – my first “blog post”. Just another example of this new life I’m living. Who knew I would become a “blogger”!? !